Do you have limited space on your vehicle? Re: Do you have limited space on your vehicle? The isolator would have to be rated pretty high tho I would think. Am I wrong? Not entirely. You can get high load isolators that can run in a linked mode whereby it's carrying the amperage load on the main battery. Normally though a secondary battery isolator isn't designed for continuous linked operation, rather serving as the charging source for the 2nd battery (which is a low amp load). The secondary battery should be large enough to cater for the anticipated amperage draw (e.g. the compressor) since that is what should take the load. There seems to be enough resistance even in solid copper, fine strand, power cables to slightly isolate other batteries. We have quite a few customers with dual and/or auxilliary batteries, all in parallel, and the one that's connected to our compressor gets deep cycled and replaced more often than the others. 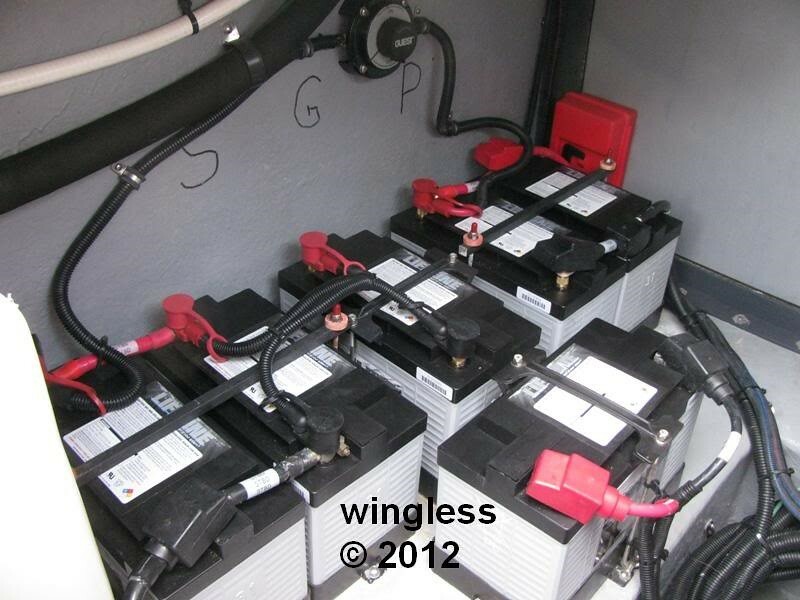 Here are my three banks of Group 31 125 Ah batteries. They are arranged as three batteries for the starboard bank, two batteries for the port bank and one battery dedicated to only starting the generator. The three and two can be shorted together using the rotary switch. I use that when playing the stereo for extended duration at ear bleeding volume, or when using the compressor for extended periods. My system also has two 90A alternators when the engines are running and one 70A AC / DC charger when the boat is plugged in or when the generator is running. The batteries may be connected / disconnected from the load w/ a pushbutton switch to toggle the three contactors, one for each bank. If our compressor is connected to a bus bar then it should draw from all of them equally.